What new Spring mantle do you seek to unfurl and share with the world? On this official first day of spring, beginnings and second chances are sure to be a buzzin' in your mind. The signs are everywhere. 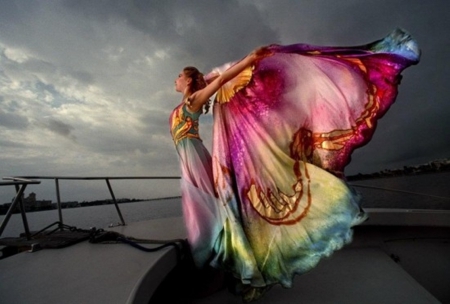 The butterfly metaphor appears in posts, poetry, memes, and Tweets. Sheesh, the Dollar Stores displayed spring items the day after Valentine's Day! Perhaps you can recall your science class in elementary school. Do you remember learning the four stages of the butterfly as an egg, larva, pupa, and adult? As a butterfly in the making, who or what do you seek to be after your long winter's nap? emerge to proclaim a new title despite all the outer urgings to celebrate Sister Spring?! What if you're just not ready despite months of cocooning? Then stay there. Be still. Know your peace. It's perfect.You're perfect. Perhaps you're' still in Stage Two, the caterpillar-butterfly phase. Yes, you could be "going caterpillar." Perhaps you're still devouring the leaf you were "born" on. You're reading, reflecting, researching, and then responding in words. Perhaps you're growing, expanding, and then molting. This means you are okay with being in the dark. This means you are where you are supposed to be. This means you are "faithing" it until you make it. 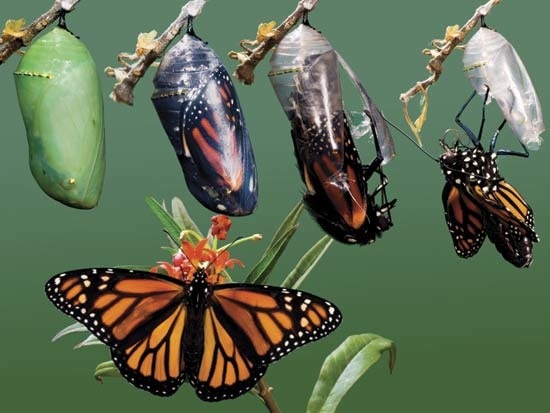 Eventually, you will evolve to Stage Three: The Chrysalis Butterfly. What butterfly stage are you in? You'll know the moment to announce your new spring mantle. Remember what Rabindranath said, "The butterfly counts not months but moments, and has time enough." P.S. Join me for the Master eCourse, Create and Write Your Personal Vision Book in 7 Sacred Steps because you're ready to soar and share your messages! Of course, you've got 18 minutes a day for just 33 days to create a new story, a new "tell-a-vision" of your desired life. Register now for the early bird price before April 10. Beautiful post and twist on Spring Lore. I feel I'm in the exciting yet painful process of breaking out of the cocoon. Looking forward to seeing your new, beautiful wings, Laura! You'll soon be SOARING! Whooshhhhh! I love your "permission slip" to be in whatever stage we are. Accepting where we are on our journey is a sure recipe for joy. Rachel, you made me smile when I read "permission slip." Since Gavriel is still in school, PS are probably often in use...and we adults needs them too! Excellent post Lore, and I don't think you could have found a more captivating photo to pair with it! Thanks for the kind words, Crystal. It is a powerful image...happy you liked it. Happy Sprng to you, too, Jill! How tener that butterflies are your dad's symbol...double rainbow's are my dad's way of connecting with me. Feeling like I need to stay in my cocoon for a while, but life circumstances are forcing me to come out for a while. So I'm creating a traveling cocoon (kind of like a spiritual camper) to take with me so I can go back in for moments of renewal until I feel strong enough to unhitch it for good! Enjoy "going caterpillar," Barb! I AM. I like the idea of your traveling cocoon...do you have a name for "her?" Hi Lore! Another beautiful post! I think the slow transition out of the cocoon and into the world is where I'm hanging right now. I'm excited for seeing the spring but not forcing against mother nature's rhythms. Thanks for this beautifully written post! Enjoy your "going caterpillar" time...as I said to Barb, I'm also there...let's all be gentlewith ourselves.xox0 Thanks for your kinds words, Krystal. Many thanks for your kind words, Maria. Congrats on being ready to SOAR and FLY HIGH! Let me know how I can support.